In calling for a “two-state” solution to the Israeli-Palestinian conflict, the special Synod of Bishops for the Middle East has echoed the solution that Pope Benedict XVI urged on his visit to Israel last year. 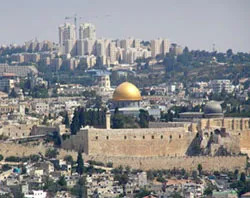 “We hope that the two-state solution might become a reality and not a dream only,” the bishops said in language very similar to that used by Benedict on his trip to the Holy Land in 2009. The nearly 200 bishops participating in the two-week synod presented their final communique in a private session on Oct. 22. In addition, they gave the Pope a set of 44 proposals to consider in drawing up his own reflections on the synod, which will eventually be issued in a document known as a post-synodal apostolic exhortation. The synod’s final message underscores the aspirations of Christians and the challenges they face in the region. And it calls on the local churches and individual Catholics to take concrete actions to ensure the future of Christianity in the Middle East. Among the many challenges facing the Church are the ongoing, daily ramifications of the Israeli-Palestinian conflict, which has hung like a cloud over the region since 1948 when Israel was declared a sovereign nation. The bishops said the framework for peace must include the “application” of United Nations Security Council resolutions and “taking the necessary legal steps to put an end to the occupation of the different Arab territories." The Security Council in the past has called for Israel to withdraw from territories secured during the 1967 Arab-Israeli war and more recently has called for a so-called two-state solution that envisions Israelis and the Palestinians living side-by-side with secure and mutually recognized borders. The final synod communique echoes the positions outlined by Pope Benedict XVI during his farewell address on May 15, 2009 at Tel Aviv, Israel's Ben Gurion Airport. He urged leaders to "break the vicious circle of violence” and to begin the path of “genuine reconciliation and healing." The Pope added: "Let the two-state solution become a reality, not remain a dream," he implored. "And let peace spread outwards from these lands, let them serve as a 'light to the nations,' bringing hope to the many other regions that are affected by conflict." Again at the synod's closing Mass on Oct. 24, he made an appeal for peace in all the Middle East. "Peace is possible. Peace is urgent," Pope Benedict said.